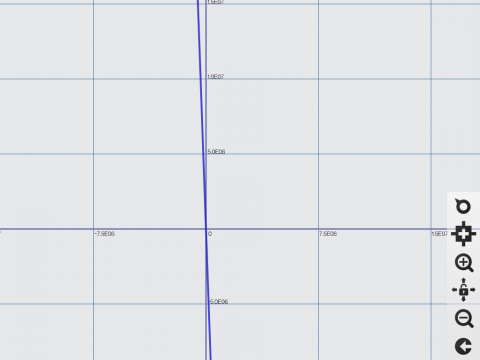 Calculator # is a free iPad calculator app with graph plotting and algebra support. It is one of the most powerful free calculator app for iPad which I have ever used. This app is capable of solving basic problems as well as the advanced like the one faced by engineering or mathematics students at higher level. You can use it to solve trigonometric, logarithmic, algebra, factorial, permutations, combinations, GCD, and many more types of problems. 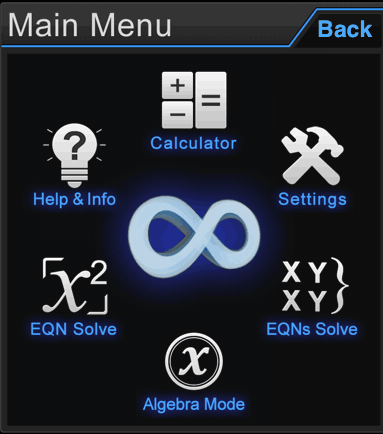 The app has specific modes for solving algebra equations including the quadratic equation. You can even plot graphs for mathematical problems. The app also maintains a history of problems solved by you so that you can copy them instead of writing and solving them again. For angle related problems, app supports Degree, Radian, and Gradient unit. The app also has feature for auto converting decimal values to fractions. The app supports various display modes including the scientific notation method. After launching the Calculator # on your iPad, you will see the interface as shown in screenshot posted below. 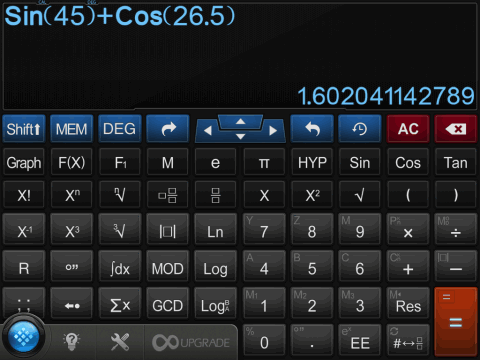 You can easily see that the calculator app has neatly designed interface with all the keys quite large and function written in large and bold fonts. This makes it easier for you to type problems. You can see the numerical keys are at right side along with four basic mathematical operation keys. The key for getting the answer is also at bottom right side. The keys for entering different mathematical operations are on left side. 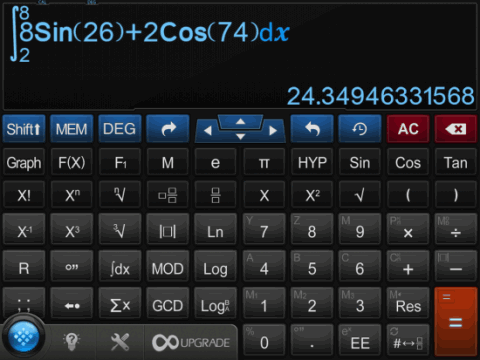 Some of the keys are: Factorial, Differentiation, Integration, Summation, MOD, GCD, Logarithmic function, etc.. You can also see that some of the keys in this app have two functions written on them with one of them highlighted while other is dull. The highlighted function is that function which each key performs by default. If you want to use the dull function then you have to tap on Shift key first. The Shift Key is present at top left corner. To solve any problems, you have to use all these keys as per the problem you are solving. If you are a solving a problem for which you need to plot the graph, then you can enter the problem like normally and then tap on Graph key to see the graphical representation. This app also has different modes of calculation which you can check by tapping on Blue color button at bottom left corner. You can choose from: Calculator, Quadratic Equation, Equation Solve, and Algebra Mode. Simply tap on the mode which you want to use. You can also make changes to Settings and UI skin of the app. Tap on Settings option to get the interface shown below. 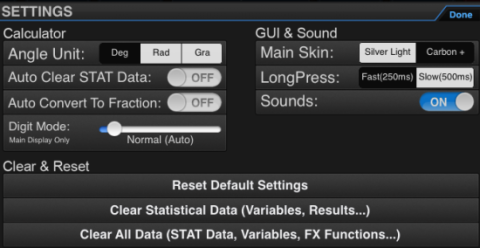 From here, you can change Angle unit, set Digit Mode display, main skin, sounds, etc.. The Digit mode has following modes: Scientific Notation, Auto Mode, Fixed Digits (from 1 to 12 digits). You may also like: 5 Free iPad Calculator Apps. Calculator # is an absolutely awesome free iPad calculator app with graph plotting and algebra support. The app is absolutely perfect in solving problems whether it’s a basic one or complex. I didn’t face problem of any kind. This app is one of those that you should try at least once. You won’t be disappointed. Note: If you are not able to search for app on App Store then search for using developer’s name Incpt.Mobis.